Among the different methods used for making rubber products is compression molding. For this, the manufacturer mixes the material and uses only the volume needed. The next step involves cutting the rubber into continuous strips. From there, the rubber compression molding process entails feeding the strips into a machine with a screw that fills the barrel with the predetermined amount of material. With the compression molding technique, the rubber then goes into a heated metal mold. As it softens and with the lid closed, the rubber conforms to the mold’s size and shape. After cooling, the expert ejects the finished product. 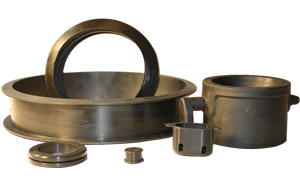 This type of forming process can produce a broad range of large and small compression molding products such as switches, bowls, plates, cups, gaskets, and so on. As with other manufacturing processes, rubber compression molding offers several unique benefits. One of the key advantages of this method over others is that it works incredibly well for making large parts. For that reason, it is the preferred option for companies of all industries, especially automotive and aviation. Another benefit is the simplicity of the compression molding technique. Compared to a lot of other manufacturing processes, this one does not require a highly experienced or extensively trained operator. Instead, almost anyone can make compressed molded parts and components with a little bit of know-how. That combined with relying on excellent quality raw material and cutting-edge machinery ensures the product meets the customer’s specifications. Because the process involved with manufacturing compression molding products is so straightforward, it is also cost-effective. Not only does the manufacturing company spend less to produce stellar products, but it then passes the savings down to the customer. Obviously, a customer that can purchase an outstanding product at an affordable price will return to the same manufacturer for future needs. There is also an eco-friendly component of the compression molding technique. As mentioned, the manufacturer measures out a specific amount of raw material, meaning that nothing goes to waste. Especially for companies that adopt environmentally-friendly practices, that is an excellent marketing point for manufacturers that provide this service. Finally, this process delivers precision compression molding products. For multiple industries, even one small error or defect could prove costly. With this particular method and the way that the mold encloses around the heated rubber as it conforms to the size and shape ensures a flawless part or component. Whether you need one or several compressed products made from high-quality rubber, you can always count on us at RPM Industries, LLC. We offer years of experience and possess unrivaled capabilities that make us a perfect choice. Contact us today to discuss your specific needs. We take our work seriously and will deliver on the promises we make.